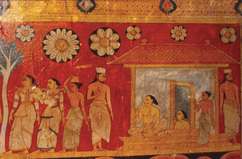 This scene from the wall paintings of the Madavala Vihare illustrates an episode in the Uraga Jataka (one of the former birth stories of the Buddha). 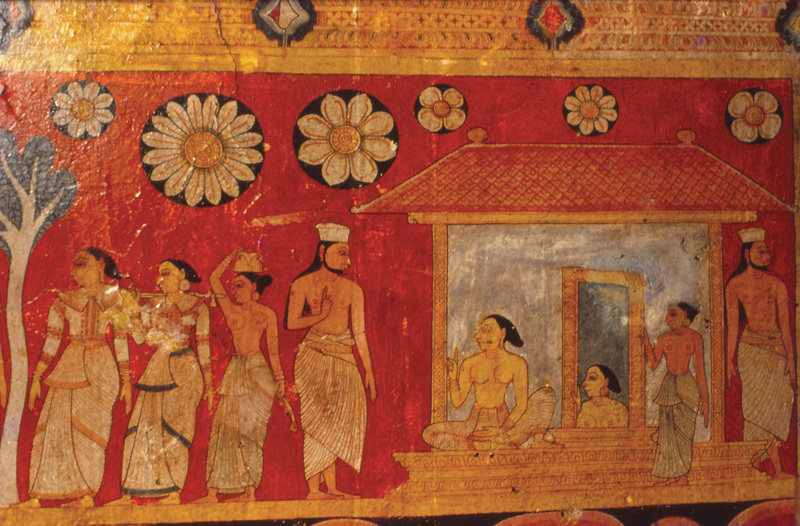 It is interesting to note that the ladies of the household, a Brahmin family according to the story, do not cover the upper part of their bodies when they are at home, but are fully clothed when they go out. In contrast, the maid does not cover the upper part of her body on either occasion. Sirima Kiribamune, "Contrasting styles of women's attires," online in Digital Library for International Research Archive, Item #12658, http://www.dlir.org/archive/items/show/12658 (accessed April 18, 2019).